Contact officials at Washington State Parks and tell them to stop the endless cycle of killing and to come up with a focused well thought out comprehensive plan, which uses humane alternatives. 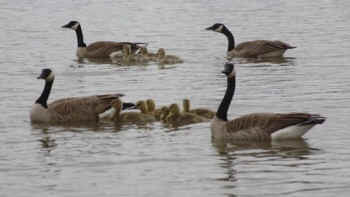 Washington State Parks hired USDA Wildlife Services to kill the geese at Lake Sammamish State Park. In all about 90 geese were herded up and gassed to death. Killing is unacceptable and we must do a better job of sharing the earth with wildlife. A few weeks ago Washington State Parks used USDA Wildlife Services to kill geese at Lake Sammamish State Park. There was no notice given to the public or any opportunity to comment. USDA Wildlife Services cruelly rounds up geese when the adults start to molt and they cannot fly. They then herd the adults and babies into pens. If they are still doing what they did in the past when they were killing geese in the Seattle parks, the geese are shoved into gas chambers in the back of the USDA trucks. The gas chambers were not designed specifically for large birds like geese. The chambers are too small for the geese to stand upright prior to being gassed to death. Multiple geese are stuffed into the chamber at the same time while frantically struggling and trying to escape. Of course this is all done under a cloak of secrecy, so that people are unaware of what is being done or how. There are many humane alternatives which work well when used in conjunction with each other. Killing the geese only creates a temporary solution, as other geese will move in, which results in an endless cycle of killing. Geese at all of the Washington State Parks are in danger. If they are killing geese at Lake Sammamish State Park, then they are probably killing them in the other state parks as well.